And while that happens we have the revelations - oh the revelations and truly fascinating world building and take on the ancient Adam and Eve mythology. The nature of Adam/God, the very different nature of Eve (which definitely flips the power scale before Adam ruined everything) the nature of Lillith, the birth of angels, of demons of humanity, why the whole idea of sacrificing women to the clearly dangerous and broken god keeps working, Metaraon and his motives towards all the events in the series so far, including the shape of this coven - so much is here. As I read this series I have an increasing sense of disconnect. It may be because it’s been such a long time since I read the first books in the series but I’ve read far longer series and not felt the same sense of shattering. I just can’t figure how we got here. How did the characters in Death’s Hand end up here? I think it could be more my confusion with the Descent Verse in general - this is a shared world with 12 separate series in it - I have read books from 6 of them and I can’t make them fit together! All of these books all belong in the same world setting but by head is throbbing trying to make them fit together. One of the reasons I’ve made a new effort to catch up on this series is that after Drawing Dead (a book I loved) I was so utterly lost and confused that I decided it was time to tackle this whole world in chronological order. Ironically most of the books and series have been excellent and if I wasn’t told they all exist in the same world I’d probably just run with it and be happy - but knowing they’re in the same world just keeps biting at me. 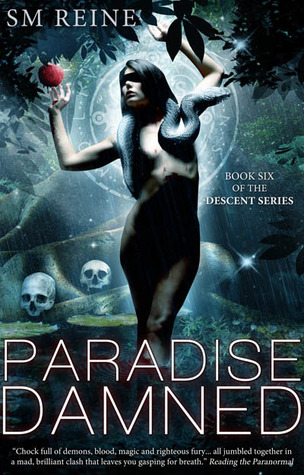 Finishing Paradise Damned marks the second of those 12 series I have no finished and I’m left feeling… accomplished. Like I am taking concrete steps in a process which also makes me question whether my desire to reach this overall goal and ur-understanding could lead me to treating the books as research “aha, this is where THAT fits in” rather than stories.